The following article is from the Confederate Veteran, Vol. VI, No. 12, Nashville, Tennessee, December 1898. 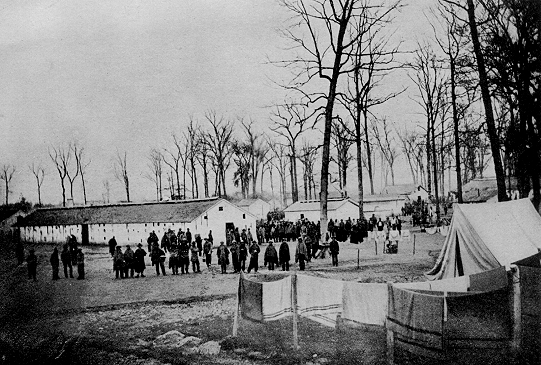 That den of misery a little north of Indianapolis, known as Camp Morton, was constructed as a fair ground. Temporary stables for horses were erected in long rows. These were converted into barracks for Confederate prisoners. In the fall of 1863, soon after the battle of Chickamauga, Gen. Joe Wheeler made a raid into Middle Tennessee, during which event Joel Womack, Jim Hood, Pete Donald, Jeff Barlow, Josh Dillon, Will Pickett, and I were captured, near Cainsville, Tenn. We were first placed in jail at Murfreesboro, sent from there to the penitentiary in Nashville, thence to the barracks in Louisville, and finally to Camp Morton. There was not a bunk in the division, so our bed during that winter was an oilcloth spread upon the earth in the aisle of these barracks. Those who had preceded us were in much want. They were dirty, pale, emaciated, ragged, and lousy. Only a few had a change of clothing. We slept in our clothing every night to keep from freezing. There were two hundred and fifty prisoners in No. 7, and about four thousand in the prison. Those who had occasion to be up at night walked upon us unavoidably, as we slept in the only outlet. We were often spit upon at night by comrades who had colds. Camp life as a Confederate soldier was hard, but prison life in Camp Morton was harder. Daily rations were eaten immediately upon being issued. We were supplied with one loaf of bread and one small piece of beef, and nothing more. It happened occasionally that we would draw this about eight o'clock in the morning, and then not get any more until the following day, late in the evening. When this was the case we became so hungry that we would stand and look for the wagons to come through the gates with our bread. Sometimes, by stealth, we would pick up potato peelings thrown out from the cook rooms, roll them into balls, and cook and eat them with a relish. The beef bones were broken into small pieces, boiled in clear water, the grease dipped off and poured into a saucer, and sold as bone butter at ten cents a half cake. Crawfish were caught in the ditches, boiled, their pinchers pulled off when hot, and then converted into most excellent soup. A cutler's dog, killed and barbecued, furnished food that we relished. Every man who was able to walk was required to fall in line for roll call about sunrise each morning. The Yankee sergeant who called the roll for our division was named Fiffer. I never heard a kind word fall from his lips. He was about grown and really a demon in human flesh. I have seen him walk through our barracks with a heavy stick in his hand, striking right and left on the heads, faces, backs, or stomachs of the poor, starving prisoners, as though they were so many reptiles, crying out: "This is the way you whip your Negroes." I dislike to write this, but it ought to go down in history. Our division was not the only one that suffered from inhuman treatment. Division No. 12, near the center of the camps, had a sergeant named Baker. One bitter cold morning while we were standing in line stamping the earth to keep from freezing a pistol shot was heard, and immediately the piteous cries of a prisoner were wafted to our ears. The poor fellow had stepped a little out of line at roll call, and for this crime(?) was shot down. I saw Fiffer strike prisoners over the head with a loaded pistol. Death had thinned our ranks so much during the first winter that we had a bunk the next. We were packed in like sardines on our sides in spoon fashion. When one became tired he would cry out, "Turn!" when all would turn from right to left or left to right. We existed in this condition, with the thermometer below zero, in open stables without door shutters, hungry, and shivering with cold, having only one stove for two hundred and fifty men. How good a piece of corn bread from home would have been at that time! While memory lasts I can never forget the great war and that cruel prison. Facts regarding Prisoner of War Camp Morton History, American Civil War Treatment of Confederate Soldiers Prisoners of War Treatment by Union Army, Yankees, Southerners, Confederates Starved, Tortured, Beaten and Abused.